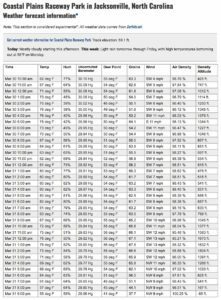 After numerous requests, historic air density data was added to the track listed in airdensityonline.com. Now race tuners can retrieve past air density data for race tracks and courses all over the world. Here is an example of one of 23 racing facilities listed for North Carolina, USA. 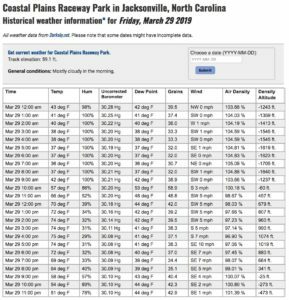 A screen snapshot is shown for air density / density altitude / water grains data for Coastal Plains Raceway Park in Jacksonville for March 30, 2019, approx. 11 am. For the site selected and the current time of the viewing, air density, density altitude, water grains, and other key weather info are all displayed. Data is accessible from mobile or stationary web devices. Clicking on the “forecast” link (shown on the lower-left of this screen snapshot), an hourly forecast appears that is used by racers world wide for event tuning plans. Next to that link in the first screen shot, a new link was added, “historical”. When that link is chosen, the previous day’s hourly air density data is shown. A screen snapshot is shown for that list. 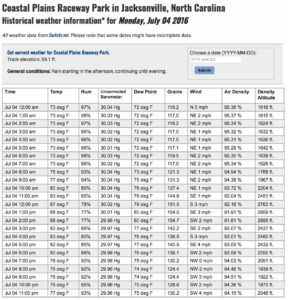 After a hectic day of racing, a tuner can look up weather data for the previous day with air density units already calculated. The tuner can better reconstruct air density records for the various racing rounds for that outing. A race tuner can enter the year, month, and day into the “Choose a date” field (shown in the right-side-center of the previous screen snapshot). The tuner can get historic air density, density altitude, grains, and other weather data going back further than yesterday’s data. The tuner can go back several years for hourly air density data. To properly adjust for a new round of racing, the tuner can look at the air density from previous outings at this track with air density units already calculated. The tuner can also look at any other track, for that matter, to retrieve air density conditions from a prior run to better select a current tune-up. 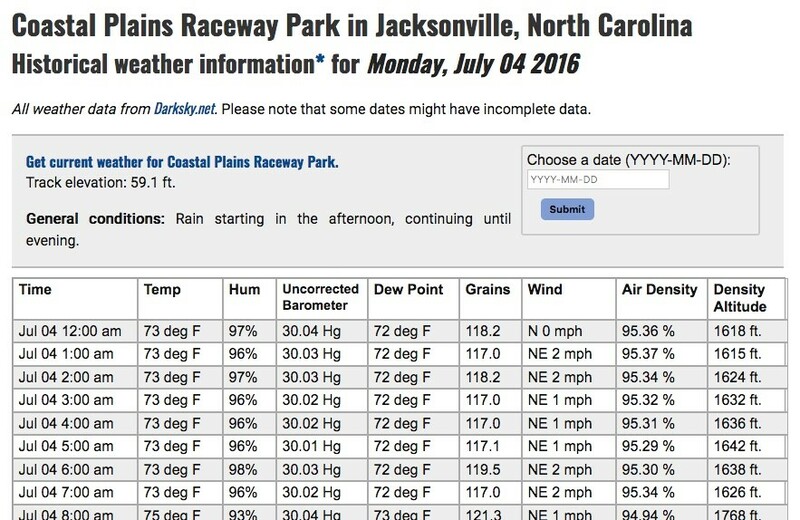 A screen snapshot is shown for an example for this same location on July 4th, 2016 if that was a previous outing. Note: Historical data is available for most of the tracks that are listed. However historical data is not available for certain previous dates at certain tracks. Some of the fields may be blank or zero for missing data. In those cases, air density & density altitude computations may be blank or zero as well. Note: over 500 tracks listed throughout the US, most racing with mechanical fuel injection. Note: over 100 tracks throughout the world, most racing with mechanical fuel injection. This entry was posted in Bob's Blog, News, Tips and Tricks. Bookmark the permalink.